Abdel Perera, ‘11, is headed to Capitol Hill in May. The School of International and Public Affairs alumnus has been awarded a 2012 Rangel International Affairs Graduate Fellowship. Perera was among 20 national finalists competing for the prestigious award. 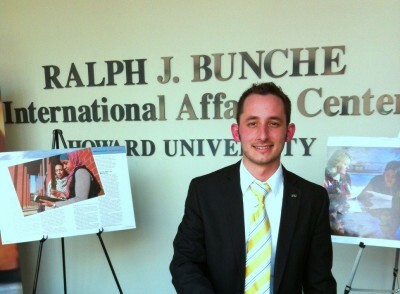 Perera attends the Rangel Fellowship selection process at Howard University in mid-March. Each fellowship award is valued at more than $90,000. The funds provide support for a paid internship on Capitol Hill, two years of graduate school, a paid internship abroad, professional development, and entry into the U.S. Foreign Service. Perera will live and work in Washington D.C. from May to August to complete the domestic internship component. He hopes to start his master’s degree later this fall in the FIU Master of Arts in Global Governance (MAGG) program. The Rangel Graduate Fellowship is a program that aims to attract and prepare young adults for careers in the Foreign Service in which they can help formulate, represent and implement U.S. foreign policy. I’m so proud of him, he deserves it! Go make us proud, Abdel!! Happy #ff & congrats to @serviceabroad volunteer alumni that won the #RangleFellowship! http://t.co/twWfosMf! SO proud of our volunteers!